Call me Charlotte Johnson and get ready for a rockin’, swingin’ good time, y’all. Are you familiar with the country song, “Just A Swingin’ “, by John Anderson? It’s a classic, I tell ya. If you know the song, you’ll know why I just might be changing my name. 😀 “Just A Swingin” has become my new favorite song ever since we put a sofa-size swing out here on our screened in porch. I kind of equate it to singing in the shower, except with my clothes on. haha Pookie might even have learned the lyrics to it by now. You can listen to it HERE. This is what our porch looked like right after we moved into our house and before I gave it its latest refresh. It was blah and boring and definitely not a relaxing oasis! But today, if ever there was a spot that I’d refer to as my happy place, there’s no doubt that this porch would be it! 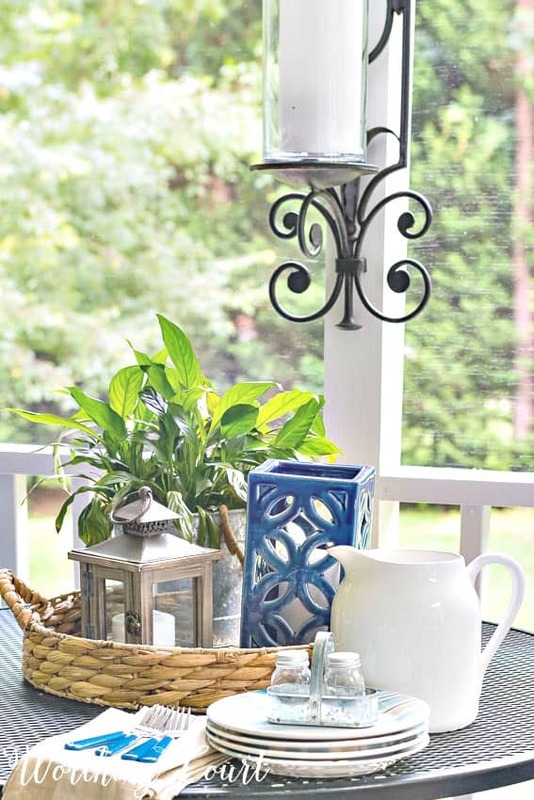 Grab your glass of sweet tea and come join me in my relaxing porch oasis. A resource list of many of the products I used is listed at the bottom. My screened in porch refresh came about all because one of our comfy rocker chairs broke and couldn’t be fixed. Boo. I intended to replace the two chairs with a couch, because hello – nap. But, while we were out looking for new chairs for the front porch (that’s a whole ‘nother blog post), this sofa swing smacked me right in my “Ooooohhhhh, look at thaaat” face! Just look at all that pulley and rope goodness! 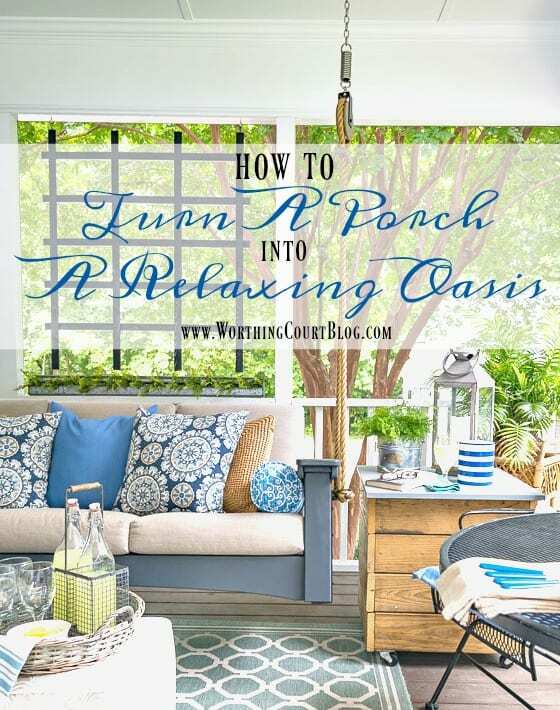 The purchase of the swing, along with the painting of the exterior of our house, prompted a whole refresh to the porch, which got me to thinking about the tricks that I use anytime relaxation is the main focus for a space at my home. BTW – for you locals, the swing was purchased at Amish Trading Post in High Point, NC. They do have a website, but don’t sell anything online, as far as I know. If you’re anywhere in the area and are on the hunt for great, quality outdoor furniture, I highly recommend you check them out. And no – they’re not paying me to say this – I’m just really impressed with their products! 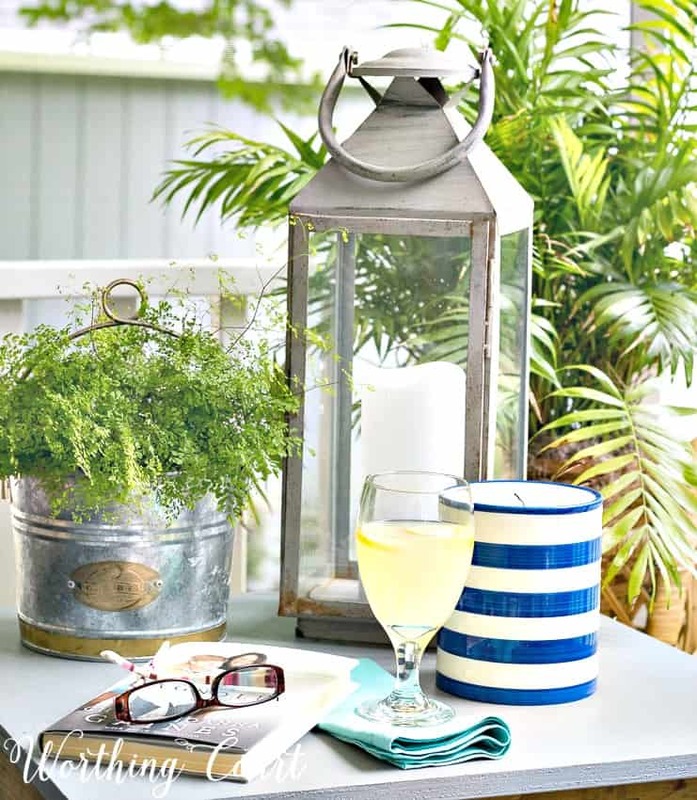 OK, back to the whole purpose of this post – creating a relaxing oasis on your own porch, deck or patio. In addition to the chairs you’d expect, I added poufs, which can double as extra seating, act as tables or to serve as a place to prop my feet up. TIP: These poufs are a couple of years old and had become pretty sad and saggy. I opened a seam up on one of the bottom side seams of each pouf and stuffed them full of pillow stuffing until they were nice and taut, then hand-sewed the seam closed. Good as new! Adding a generous amount of cushions, pillows and throws makes it all as comfy as possible. Plus, it’s pretty to look at! For me, cozy = relaxing. No one will ever accuse me of being a minimalist (if that’s your style, I say embrace it!). I try to walk the fine line of having enough stuff to make a space feel cozy to me, without having too much. I filled our porch with all of the basics and then added in the fluff. 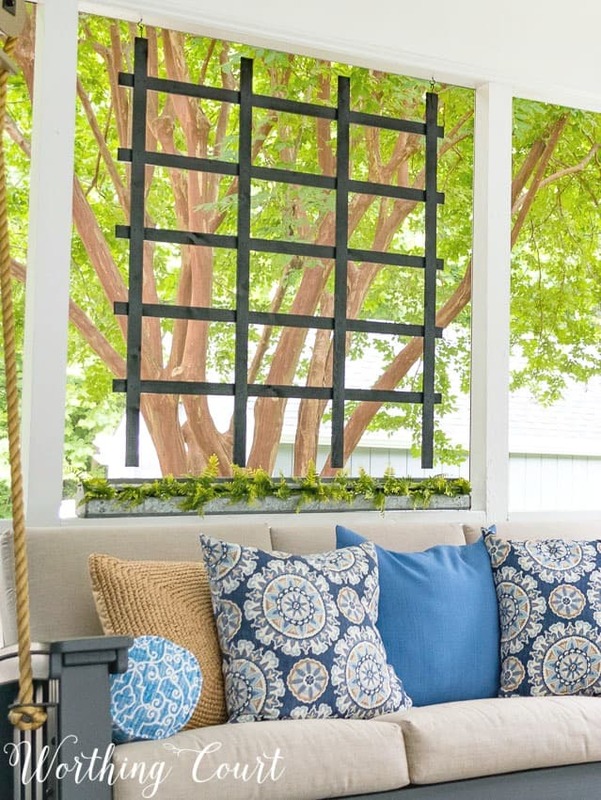 An inexpensive trellis panel, like THIS one, was taken apart, painted with black spray paint and hung using cup hooks to give the illusion of a more defined space. The trellis doesn’t obscure any of the view, but it helps to make the porch seem more like a room. I repurposed a galvanized metal chick feeder (found at a pop-up show) as a planter. Instead of spending a lot of money for individual plants, I filled it with a 6′ faux greenery garland. TIP: If you’re going to use a metal piece like this outdoors, spray it with clear sealer to prevent rust. Add ambiance with candles. I have both real and battery powered candles sprinkled throughout my porch and they’re so pretty when lit at night! Take it easy when adding pops of color that are outside of your overall color scheme. By keeping a consistent flow of colors, your eyes will relax as they travel around the room. My porch consists mainly of varying blues, grays and neutrals. The lanterns are hung from plant hooks that are mounted to 1″ x 6″ pine boards that I used my “make anything look like driftwood technique” on. Whether it’s farmhouse, modern, eclectic, bohemian or something all together different, choose the style you like and do your best to stick with it. It’s easy to place the leftovers out on a porch, where you may not see them all of the time, but you’ll find the area much more relaxing if you work to make your porch an extension of the interior of your home. Personally, it’s much more relaxing for me to look out over the yard instead of the big slab of our concrete driveway, so we’ve oriented our furniture to take advantage of that view. If your porch doesn’t have the sort of view that you’d like, create a pretty focal point and do whatever you can to draw everyone’s eye to that. I love, love, love listening to the birds and the wind rustling through the trees when we’re relaxing on our porch. If you have noise that you find bothersome, consider adding a small fountain with the sound of gurgling water, the white noise of a fan or some soothing music. We lived close to a busy city street, near a fire station (think frequent sirens), at our last house. While we couldn’t completely muffle the noise, we used a small water feature to take the focus off of all of traffic noise and sirens and found the spot much more enjoyable. Shrubbery or a row of trees can help to break up and absorb some of the sound too. 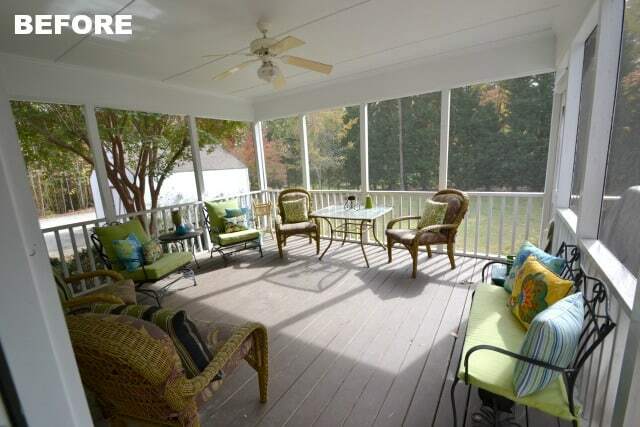 Oh, yeah – want to see the original before and the before this refresh of our screen porch? Click HERE. I love the update! So comfy and cozy! Those pulleys and ropes add so much to the swing. So excited to check out the Amish Trading Post…..always drive by but have never stopped in. What a fabulous spot to “swing” and relax. Your trellis was a great idea! LOVE that porch swing! My porch is one of my favorite places too. Love your porch! You lucky girl! I love your porch!! It is the perfect spot to relax. Enjoy!! Thanks for sharing. Such a welcoming and relaxing setting! Love it! Beautiful! Your patio is so inviting. I would sit and swing all day! How relaxing and beautiful! I would love to swing on that porch swing. I love John Anderson and I LUV that song! Makes my heart sing. Beautiful space! I’m jeaous. Beautiful porch. Love the rug and the way it looks like a cozy room. Gives me inspiration for our back deck, which is not cozy or room like at all. Thanks! Really nice, Suzy. So comfy and cozy, yet well put together! Love your new swing, too! Your porch looks so relaxing. I just loved this porch. It is really beautiful. I liked the colors and textures. You just made my change my mind about patio furniture!! I’m not going to buy the usual stuff at Lowes!!! I love your swing, but how do you hang it? Hi Laura. I was headed straight to Lowes until I saw this! lol The swing is hanging from very heavy duty eye-hooks that screw through the ceiling and up into the ceiling rafters. The hardware came with the swing, so I’m sorry, but I don’t have a link to it for you. This is beautiful! I love the sofa-swing. Looks very relaxing. Suzy, your porch looks so cheerful and inviting! Suzy, I seriously want to pop open those lovely bottles of lemonade and spend the day just lounging on that rocker! There is so much to look at on this porch, I do not know where to begin! It’s beautiful! We have been planning to build a screened-in porch, or 3-seasons porch for some time now. I’ve been saving ideas for how to decorate it, and yours definitely made the list! Thank you for sharing. Now that is what I call the perfect napping place. It looks wonderful! 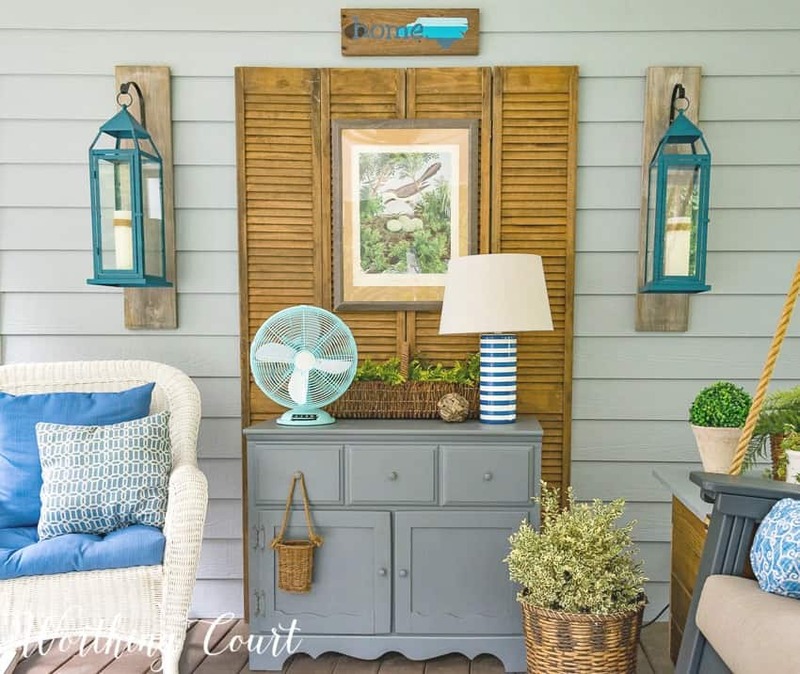 Love the read and pictures about your porch. We live in an older home with a nice size front porch and I enjoyed your ideas. I love a colorful and cozy type setting, one that looks inviting and says “come and sit awhile “. Your’s definitely says that! Thanks for sharing, I enjoy your blogs so much. 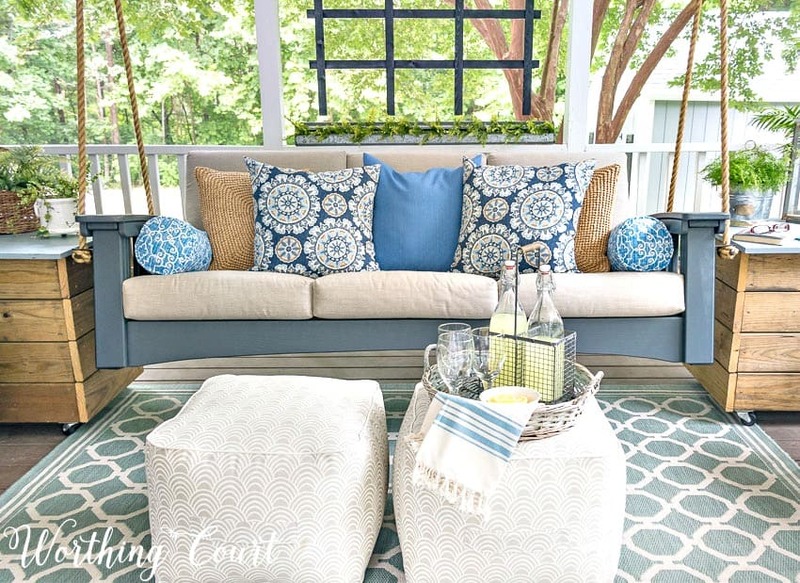 I would love to have a sun room or a screened in porch as lovely as this one, your decor choices are very inspiring. Love your porch. We added a screened porch last year and I got a gorgeous set of antique wicker at an estate sale last year. My husband and I restored and painted the furniture in the spring this year and our porch looks great and is very comfortable! I love this porch. I wish I had a screened in porch. There’s nothing like a porch swing . . . and you’re is so unique and large enough for a comfy nap! 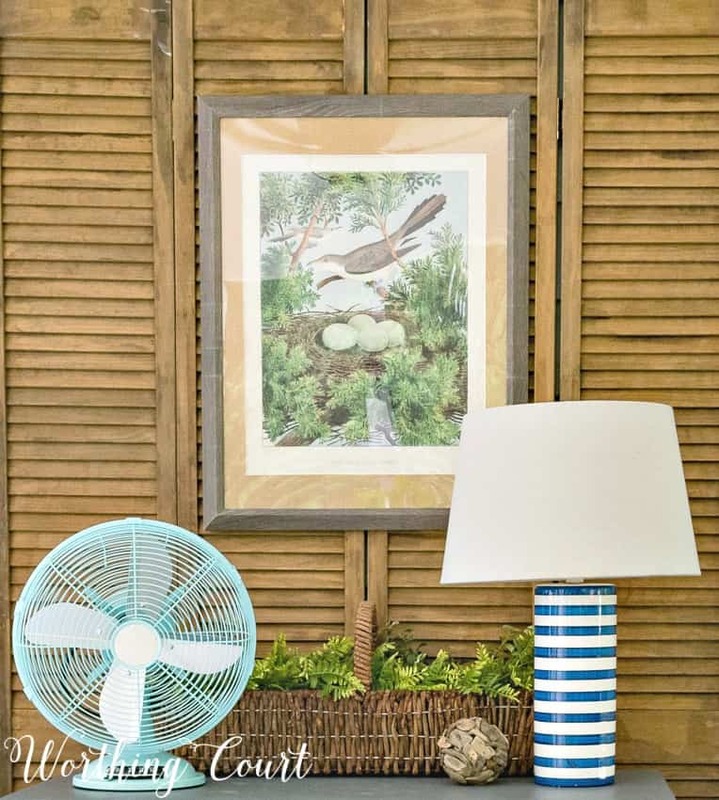 My eye was also attracted to the bird print — I’m a fan — and I love seeing the use of artwork in an unexpected outdoor location. Thanks for letting us sit awhile! I love the sea foam pillows. It just makes me want to relax. Job well done! 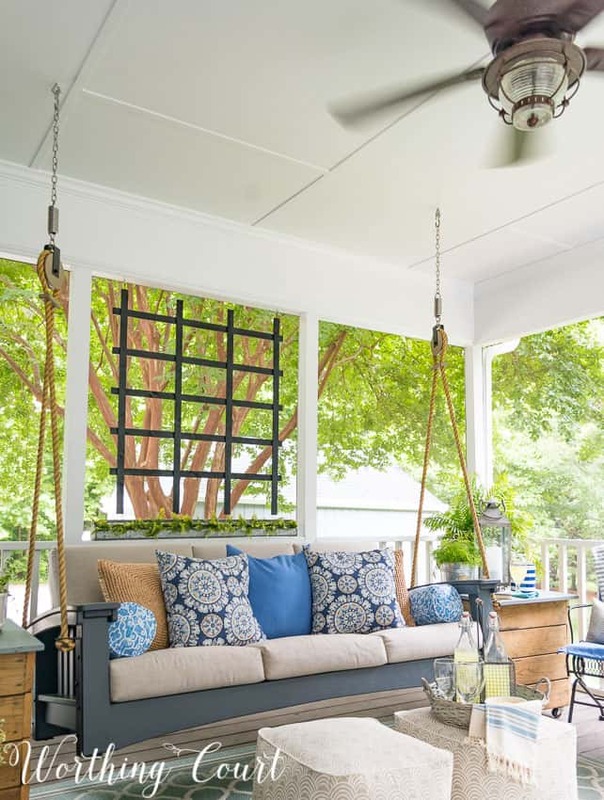 What an amazing porch to relax or entertain, I love the swing, so inviting!! Thank you for stopping by #OMHGWW this week. Suzy it looks amazing! I am trying to convince hubby into screening in our outdoor living area. 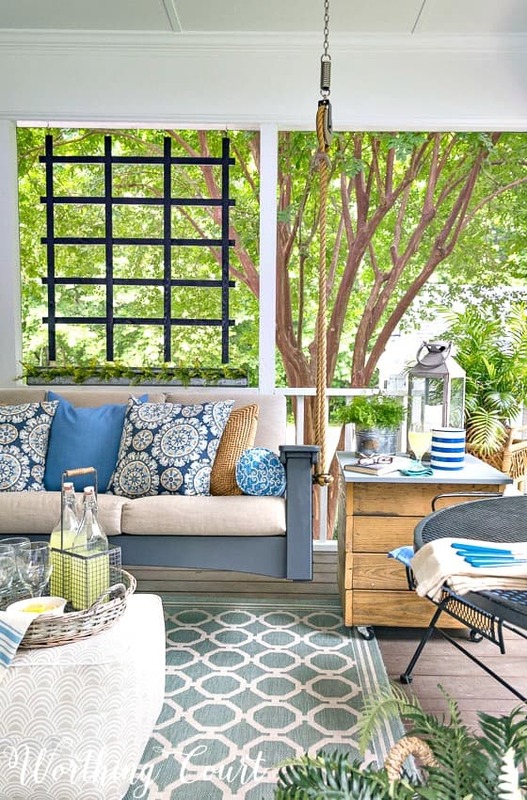 Your screened in porch is beautiful! What a wonderful way to relax. 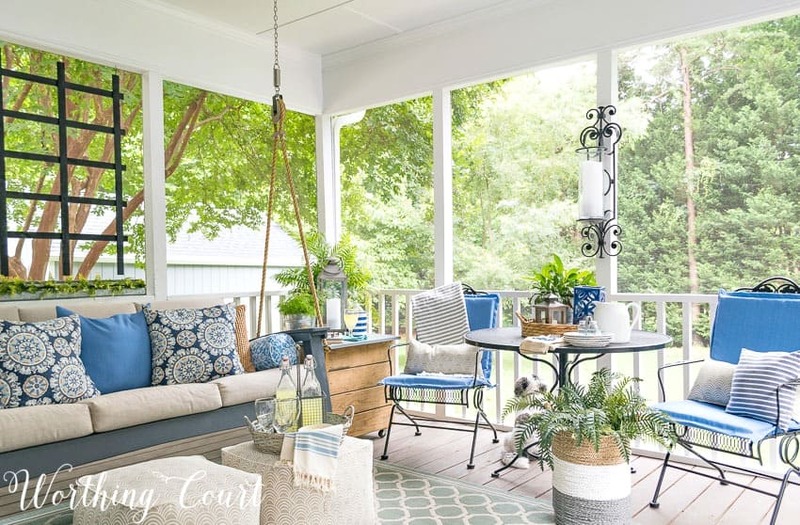 The mix of soft blues, the greenery outside and chirping birds all make for a heavenly retreat, and your little decorating touches complete the dream. I could nap on that swing all day!! I was really surprised by how much of an impact the simple trellis has hanging behind the swing. It gives such an illusion of privacy without obscuring the view. Gonna steal this idea for my porch! Your porch looks so peaceful and comfortable. I like the color palette that you chose for summer, and I like how you stuck to the color palette to create cohesion in the space. The Amish-made swing is an especially beautiful piece. Beautifully styled as usual. Your sofa swing is the bomb! You will be one of my features this week at http://www.fabifabu.com/2017/07/16/inspiration-galore-project-party Thanks for sharing see you there!! Beautiful porch! How do you protect everything from rain? Hi Heidi. The only time that anything on the porch gets wet is where there is a hard, wind-driven rain. But, even that doesn’t really matter since all of the chairs, the swing and the cushions are made for outdoors. The only piece that isn’t an outdoor piece is the small gray chest. It never gets wet because it sits so far into the porch, but just to be on the safe side, I used exterior paint when I painted it. You have such a knack for creating these relaxing and inspiring places. Wish I could sit with you on your porch and talk decor talk. I love your porch! It is so inviting, and it’s a great place to entertain! This is just beautiful and so original. I love the eclectic mix and colors used. I love the porch…would really enjoy a nap in the swing. Thanks for sharing!! This is perfect, the colors, textures, coziness. You can almost feel a cool summer breeze. Love the porch! One question though. How do you protect everything, especially lamps and decor pieces when you get a rain storm? I gather the fabrics are outdoor fabrics, but I find myself bringing everything else inside. Our screen covers go on the outside and aren’t easy to just put for a storm. Hi Pamela. Good question! There are a couple of ways that I do that. 1. Anything that isn’t considered outdoor safe, such as lamps, I keep well inside the porch where rain can’t blow on it (unless we were having hurricane weather, then I’d bring it in and yes, that can happen in central NC 😀 ). I’ve had a lamp against the back wall of the porch for two years now and it’s still going strong. 2. To protect any painted furniture, I make sure to use exterior paint – like you’d paint the outside of your house with. 3. To protect any small accessories that might get wet/damp, I spray them with clear sealer in a matte finish. 4. I have a framed art print that I was worried about crinkling up in the humidity, so I had it laminated before I framed it. 5. 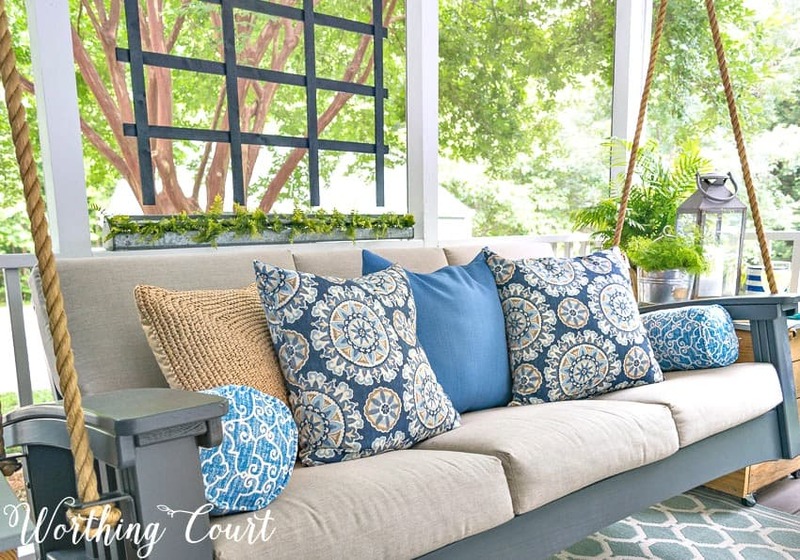 And yes, you’re right – outdoor fabrics and indoor/outdoor rugs. Hope this helps! Thank you so much, I guess I’m doing it right then! You also gave me a couple new ideas to protect decor. I’ve been wanting to ask you…have you ever aged something galvanized? I purchased a 3 tier metal tray at Hobby Lobby for only $20 but I decided that I dont care for the shiny galvanized metal look. I dont really want it rusty but more of a dull gray finish. I would sure appreciate any ideas you might have. I’m a little intimidated with a larger item like this one to try an age it. Thanks Suzy for the references. 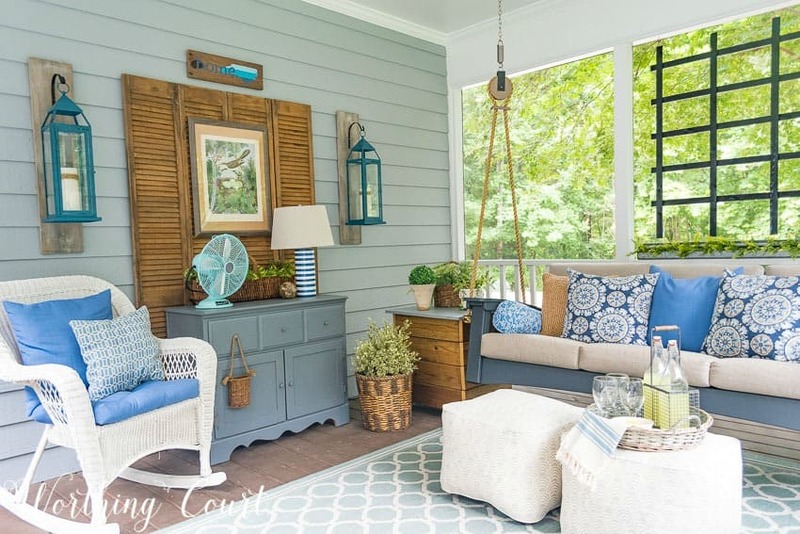 Bye the way… I love love love all the texture and shades of blue on your screened porch. Such a relaxing place! !